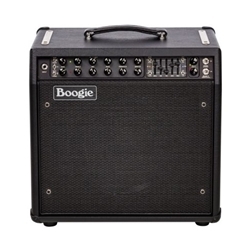 The Mesa/Boogie MARK FIVE: 35 represents the latest upgrade to the already popular mini-platform MARK FIVE: 25 combo. Mesa adds their legendary and first-ever MARK preamp to this light-middleweight rendition, expanding upon their traditional 4xEL84 successful models to create a powerful guitar amp far above its class. As if their MARK Series preamp wasn't enough, Mesa further bolsters the tone of this combo, adding a Channel Independent SOLO Feature, long-spring tank, and complete set of Voicing Choices from their CABCLONE™ with an added VINTAGE setting to its on-board DI Output as well as upgraded footswitch. Utilizing Mesa/Boogie's Dyna-Watt™ technology within the Multi-Watt™ Channel Assignable power array, the MARK FIVE: 35 offers substantially more headroom, punch and power in 35 WATTS, while the 25 and 10 watt options provide a looser feel and enhanced power clip expression. Each of the 3 Power Level settings have their own sonic character and can be used to further authenticate the sound styles you are aiming at with your Mode & Preamp settings. The MARK FIVE: 35, like the MARK FIVE™ it’s born from, is really a collection of iconic amplifiers — it’s a living history of MESA/Boogie! Channel 1 covers the entire gain spectrum from chiming tight clean sounds, through furry, edge-of-clip, to Classic Rock CRUNCH and all the way up to burning saturated Lead sounds. Channel 2 delivers the legendary MARK II-C+ and warmer, rounder MARK IV in all their glory and the XTREME Mode from the MARK FIVE. Find added tone shaping in Channel 1 via the MID/BOOST feature on the MARK FIVE: 35 . From 0 to 5 on the MID/BOOST you will find the normal range of a standard MID control in a condensed form. From 5 to 10 on the MID/BOOST, a wonderful graduation of overdrive possibilities unfolds, enhancing gain over a broad midrange spectrum and increasing the versatility of each of the 3 Modes in Channel 1. CLEAN and FAT give way to furry and howling, while CRUNCH rolls past Classic Rock to unleash Metal rhythms and molten layers of harmonic complexity for Lead work. Mesa's legendary BOOGIE® 5-Band Graphic EQ provides the ultimate in sonic flexibility. Dial your sound in with the standard Tone controls and if further shaping is desired, employ the targeted power of the 5-Band Graphic EQ and tweak as you see fit. The MARK FIVE: 35 upgrades include additions to the on-board CABCLONE D.I. feature, which now offers three classic “cabinet simulated” VOICING Modes and gives you the full feature set of the stand-alone CABCLONE D.I. minus the OUTPUT control.